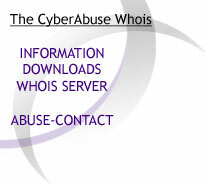 The goal of the CyberAbuse Whois is to provide an automated way to find some informations about any IP (v4) or host in the world without having to choose a whois servers. The main purpose of this tool is to help administrators and home users to easily find the abuse contact for a specific IP or host address. It uses the following Regional Internet Registries (RIR) whois : ARIN, RIPE, APNIC, JPNIC, KRNIC, LACNIC, BRNIC and the ERX project data. It also uses the SwiNOG/FRnOG routeserver data to get informations about AS. The technology used to find the appropriate informations about a specific network has been tested for a few years, however, some bugs can still exist. Don't hesitate to report those by following the procedure detailed in the README (*nix) or README.txt (Win) file included with the software. The result given by this program is provided for information only, we can't take responsibility for any error or misuse of this tool. All the data are free of access, but your queries might be blocked if you hammer the whois servers too much, thus resulting in some error messages. If you run a batch which users the zcw client software, you might want to insert a 'sleep 3' between each of your queries. Copyright may apply to some of the said data. If so, an URL or a note is added at the end of the result.